After dropping a season-high eight games in January, losing an All-Star big man in Kevin Love for potentially two months, enduring the shaky play of a recovering Isaiah Thomas and facing the uncertainty of LeBron James’ future with the team, so far, the Cleveland Cavaliers have sustained yet another season under scrutiny. In LeBron James’ 2015 return to the Cavaliers, he promised the city and organization a title. Not only did he deliver, but he brought the team to three consecutive NBA Finals. Yet despite his success, it has almost become tradition that he and the team undergo scrutiny in January. 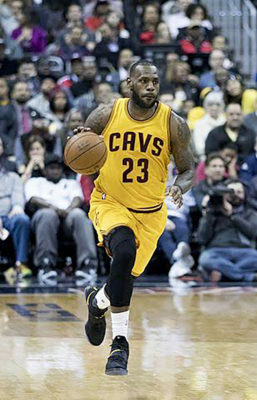 In 2015, after reports surfaced about James’ poor relationship with Cleveland head coach David Blatt, speculation loomed large about the Cavaliers’ ability to contend and gel under Blatt, notwithstanding Cleveland’s Eastern Conference Title. Just one year later, the Cavaliers fired Blatt midseason and gave the starting job to their associate head coach Tyronn Lue. The media scrutinized both Cleveland’s relationship with Blatt, and Lue’s ability to get the job done. However, the Cavaliers finished that season by defeating a 73-win team in the finals. Last season, James called out Cleveland’s front office, claiming he needed additional playmaking after the Golden State Warriors acquired All-Star forward Kevin Durant. Members of the media, who did not seem to have a problem with Durant’s move from the Oklahoma City Thunder to the Warriors, were up in arms about James’ call for help. The Cavaliers turned on the switch, finishing the playoffs with a 12-1 record before losing to Golden State in the finals. So here we are, January of yet another year, questioning LeBron James and the Cleveland Cavaliers’ ability to reach another NBA Finals in an even weaker Eastern Conference. Despite all the new and unique storylines emerging in Cleveland’s locker room, the plot has ironically stayed the same. The Cavaliers will coast through the rest of the regular season with one of the top seeds in the East, and meet the Warriors in the NBA Finals yet again. Cleveland has an abundance of veterans who all know the value of conserving energy during the regular season. With 82 games and 16 teams playoff teams, giving maximum effort on a nightly basis isn’t sustainable for many of the Cavaliers’ players. Don’t get me wrong. I just watched Cleveland lose to some of the league’s top teams this past month in embarrassing fashion. I watched a game where the team gave up 148 points and another where players looked like they had given up in the second quarter. The team’s defense is slow. They are the oldest team in the league by a significant margin. However, come playoff time, the Cavaliers’ biggest regular season weakness — age — might be their greatest strength. The Cleveland roster is stacked with guys that have proven themselves as clutch shot-makers and savvy defenders. Beyond just LeBron James, the Cavaliers have numerous players who have individually willed old teams to deep playoff runs. Last year, point guard Isaiah Thomas took the Boston Celtics to the Eastern Conference Finals before being traded to Cleveland. Shooting guard Dwyane Wade has shown his ability to perform in big games with and without LeBron James. Even point guard Derrick Rose took the Chicago Bulls to the Eastern Conference Finals in 2011, falling to James and Wade’s stacked Miami Heat team. One of the Celtics’ best assets is its youth and athleticism, something the Cavaliers are used to playing against. The team is one of the best defensive squads LeBron has faced in his career, yet stands no chance in the playoffs against Cleveland. Give me Wade and Thomas late in a playoff game to make big plays over Boston’s inexperienced shooting guard Jaylen Brown and small forward Jayson Tatum. Give me the top three shooting guard of all time over the athletic and inconsistent shooting of Brown. Give me the 5-foot-9 guy, who averaged nearly 30 points per game last season, over the rookie. In May and June, intangibles always seem to overshadow the stat sheet. The team that makes the smartest plays, the clutchest shots and plays the best defense down the stretch is the one that wins. Again this year, that team is the Cleveland Cavaliers.